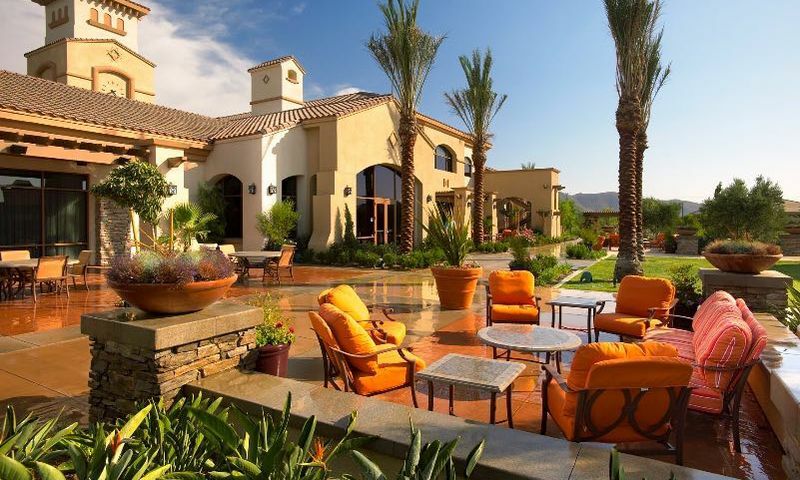 Solera Diamond Valley by Del Webb is another community to add to their award-winning lineup of active adult communities in Southern California. This 573-home community in Hemet, CA combines the renowned Del Webb lifestyle and amenities in a smaller, more intimate setting. This community is set in the heart of California's Inland Empire. This ideal location is within 100 miles from many of Southern California's greatest attractions. Active adults will cherish the boundless social and recreational opportunities both in the community and in the surrounding region. At the heart of Solera Diamond Valley is the 23,000 square-foot Mountain View Lodge, the community's hub for all fitness and social activity. It includes a state-of-the-art fitness center that features the latest cardiovascular and weight-training equipment. The premier workout facility includes an indoor lap pool and spa, indoor walking track and aerobics studio. The clubhouse also hosts craft and hobby studios, a ballroom, computer station and billiards. Homeowners can also gather for clubs in the multi-purpose room, relax with a good book in the library, or join a game in the card room. A catering kitchen, performing arts space, and a coffee bar round out the indoor amenities in this community. Solera Diamond Valley boasts an array of outdoor amenities so residents can take advantage of the Southern California climate. Residents can swim a few laps in one of two outdoor pools or relax on the patio. Neighbors come together to grill in the BBQ area or play a game of bocce ball. Residents who prefer an outdoor workout routine can use the walking and biking trails or challenge a friend at one of the tennis courts. A fishing lake provides a serene place to unwind on a beautiful day. With all of this outside their front door, active adults in Solera Diamond Valley will always find an activity to fill their schedule. Solera Diamond Valley offers 18 distinctive single-family ranch-style floor plans that range from 1,240 to 2,370 square feet and offer two to three bedrooms and two to three bathrooms. All homes include a two or two-and-a-half-car garage, volume ceilings and a covered porch or patio. Del Webb has incorporated some of the latest sought after quality upgrades and energy efficient design practices into their homes. Buyers can choose from new construction and pre-owned resale homes that offer gourmet kitchens, spa-like bathrooms and expansive great rooms. Residents here are pampered with opportunities to enjoy a physically active and socially engaging lifestyle. The community activities coordinator is continually providing the residents with an exciting lineup of activities that include cards, dance classes, hiking trips, arts and crafts, pickeball, tennis, and yoga. There are also holiday parties, BBQs, and baseball game outings for a day of mingling with your neighbors. From pickleball to Pilates, Solera Diamond Valley's clubs and activities will help you pursue your passion while finding new ones. Solera Diamond Valley has a lot to offer and the surrounding attractions in Southern California are what make the community even more appealing. Los Angeles, Orange County, and San Diego are all accessible in less than two hours. The cultural and entertainment venues along the southern California coast are endless. Whether you want to enjoy world-class shopping, great restaurants, sandy beaches or professional sporting events, there is something for everyone. Plus, places like Disneyland, Sea World and the San Diego Zoo are great destinations to take grandkids when they visit. To the north and east of Solera Diamond Valley the San Gorgonio and Santa Rosa Mountains in the San Bernardino National Forest climb to over 11,000 feet. The deep valleys and scenic ridges are great for hiking, mountain biking, camping, fishing and horseback riding. Joshua Tree National Park is two hours to the east and is great for rock climbing and birding. Palm Springs, famous for its resorts, spas and golf courses, is one hour east. Whether relaxing at home or venturing out with friends and neighbors, active adults in Southern California are happy to call Solera Diamond Valley their home. Mountain View Lodge - 23,000 Sq. Ft. There are plenty of activities available in Solera Diamond Valley. Here is a sample of some of the clubs, activities and classes offered here. The Mountain View Series homes cater to active adults who want added luxuries such as ten-foot ceilings, Corian countertops, and 36-inch kitchen cabinets. Ranging in size from 1,240 to 2,230 square feet and offer two to three bedrooms, two to three bathrooms, and an attached two or two-and-a-half-car garage. Most of the homes in the Mountain View Series are available on a resale basis. The Diamond Valley Series is ideal for homebuyers who want to enjoy the Del Webb lifestyle on a smaller budget. These well-equipped homes provide single-level living but without as many included upgrades as the Mountain View Series. The Diamond Valley Series ranges in size from 1,294 to 2,370 square feet and feature two to three bedrooms, two bathrooms, and an attached two-car garage. Most of the homes in the Diamond Valley Series are available on a resale basis. The Living Well Collection ranges in size from 1,511 to 2,340 square feet and features two to three bedrooms and two to three bathrooms. These single-story homes come with a two or two-and-a-half car garage and an optional sun room. The Living Well Collection is available on a new and resale basis. My kids finally convinced me it was time to "settle" down for retirement and I have been very happy with my decision to move here. I love everything but my favorites have to be the indoor walking track, the outdoor pool and the clubhouse patio. My home was a great deal too with everything I wanted, plenty of space and nice features like granite and hardwood. I started knitting and enjoy the book club too. I love how relaxed I feel here! 55places.com is not affiliated with the developer(s) or homeowners association of Solera Diamond Valley. The information you submit is distributed to a 55places.com Partner Agent, who is a licensed real estate agent. The information regarding Solera Diamond Valley has not been verified or approved by the developer or homeowners association. Please verify all information prior to purchasing. 55places.com is not responsible for any errors regarding the information displayed on this website.